This order was simply the tidiest layout on my little breadboard; I didn’t bother getting the OUT* pins in sequence. The only critical pin is DATA_AV, attached to Arduino pin 2; an interrupt handler listening to changes on that pin does all the work. It’s worth mentioning that pins 3-5 are all part of the same port on an Arduino Uno (specifically, PORTD), which I used for my initial experiments. The Leonardo uses a different microcontroller with a weirder layout of ports, so I’m just reading the inputs with old digitalRead(), but the consecutive pins are still useful for iterating. The Arduino sketch itself is moderately simple. As I mentioned earlier, it uses an interrupt handler (handleKeypress())attached to pin 2 to actually handles the key presses on the keypad and send the corresponding USB keyboard scan codes. Note that the values sent as the first argument to sendKey() are the codes that the keyboard uses to represent the keys, not the characters. // Emergency escape. If pin 13 is LOW, output is inhibited. // Read the key pressed. // Enter is probably more useful. // Non-standard keys, arbitrarily mapped. // Send multimedia keyboard "Volume Up"
// Send multimedia keyboard "Volume Down"
// keys, not just the one identified by OUT*. // The keypad's DATA_AV and OUT* should be attached to pins 2-7. 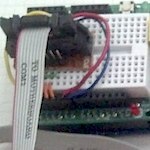 Use a smaller microcontroller board, one that can fit inside the keypad’s housing. The 9-pin cable is attached by a form of spade connector, so if I can find similar connectors, the entire operation can be done non-destructively. Use an entirely different microcontroller, one without the Arduino bootloader. The Arduino Leonardo was great for prototyping, but it is much larger and more powerful than I need — and, at $20, more expensive. I could use a microcontroller like AT90USB82 with LUFA. Since all I really need are eight GPIO pins (two for USB, six for reading the keypad), and the device doesn’t have to respond much faster than its human operator, I could use an even smaller/cheaper microcontroller with software USB emulation. Tidy up the sketch. The code isn’t the cleanest. Seeing it here, I can spot a couple of things I’d have done slightly differently, but these are moderately trivial. Better to post code I know works. Get the ‘Play/Pause’ key to work. Maybe this is just a Mac thing, but I’ve seen a couple of things that imply that some of the farthest ‘multimedia’ keys function somewhat differently than the normal ones. Rewrite for a completely different framework, like LUFA. This would make at least the first point moot. If/when I continue this project, I’ll continue posting my progress on the blog!